Having sushi for breakfast might seem peculiar but that’s how I started day 7 of my Japan trip. Yamasan Sushi is known for it’s decadent kaisen don (rice bowls topped with fresh seafood) and is located on the fringe of Omicho market. Dining at breakfast is a great way to beat the crowds that form during lunch time for this gorgeous cuisine. For more information and mouthwatering photos, head to my review here. After such a filling meal, we headed into Omicho market to have a wander. As Kanazawa’s largest fresh food market, Omicho market has around 200 stalls selling seafood, meat, vegetables and an array of prepared snacks and dishes. During our walkabout, we happen to stumble across Hyakuman-san, the mascot of Ishikawa Prefecture. For the uninitiated, cities and prefectures in Japan have their own mascots, some are cute while others are bizarre. Hyakuman-san is a golden, floral patterned Daruma Doll with a mustache. After a 20 minute walk, my friend and I reached the first tourist attraction of the day – Kenrokuen (兼六園), one of the Three Great Gardens of Japan. 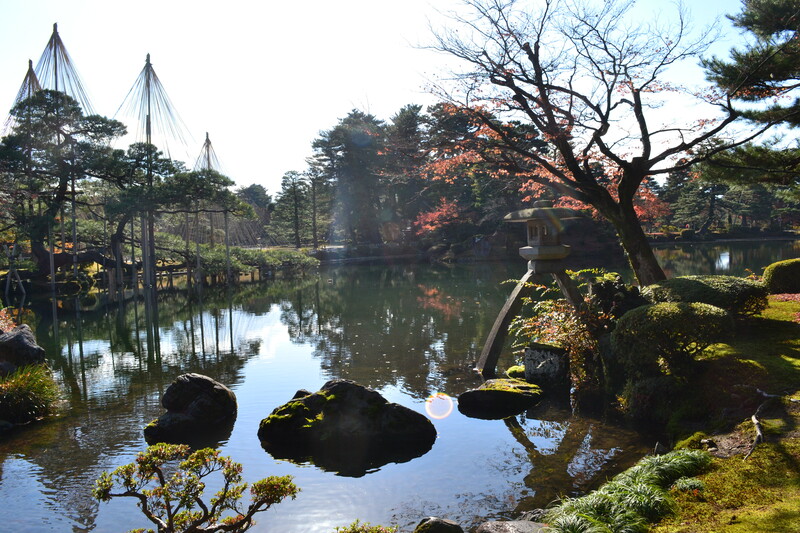 As you can see from the map above, Kenrokuen is quite expansive and can take several hours to walk through. My friend and I spent 2 hours meandering through the gorgeous garden, stopping at the main sights and taking it the tranquility and peace. Our next stop was the 21st Century Museum of Contemporary Art (金沢21世紀美術館) which is conveniently located next to Kenrokuen. As it’s name implies, the museum focuses on contemporary art with permanent pieces by James Turrell, Atsuko Tanaka and Isa Genzken. One of my favourite artworks at the museum was Leandro Erlich’s “Swimming Pool” – a very unique piece were visitors can appear underwater in a pool. As we headed back to the city center of Kanazawa, we came across a cafe with the peculiar name of “World’s Second Best Freshly Baked Melon-Pan Ice Cream”. With our sweet snack in hand we strolled towards Higashi Chaya District (東茶屋街) – a traditional neighborhood dating back to the Edo period (1820). The district features several chayas (tea houses) which were used as exclusive restaurants where geishas would perform during feasts. Now the tea houses have been transformed into shops and cafes for the general public. After strolling through the main street, we headed back to the hotel to pick up our luggage as we were catching a JR train to Kyoto. The 2 hours and 10 minute train ride sped by quickly and before we knew it we were pulling into Kyoto station. From the station, we walked to our hotel to drop our bags and headed quickly to dinner at Katsukara – a Tonkatsu (fried pork) restaurant. We knew Katsukara was a popular restaurant and had preempted a line outside but we didn’t expect having to wait 40 minutes. As you wait, I would recommend looking at the window display to help you decide what to order! I went with the popular Tenderloin cutlet zen-set which came with a deep fried piece of pork, shredded cabbage, a bowl of rice and miso soup. As you bite into the tenderloin, you realise that this no ordinary tonkatsu. It’s an incredibly balance between the crunchy batter and the juicy meat inside. Our 40 minute wait was worth it. After such a jam packed day, my friend and I agreed to retire early, so we could be well rested to explore Kyoto the next day.